The biggest problem folks face in planning an event is having the space to do it right. Putting your event in a space that is inadequate can make all your guests uncomfortable. Having too much space for your event can make it feel empty and poorly attended. To determine your event needs, simply enter your details below. When selecting the size of your dance floor, a good rule of thumb is choosing a size that will accommodate a third of your guests. See the dance floor matrix to determine the right size. Other things to consider are space for catering staff, lounge space(s), and reception space. When considering a tent for your event, space is a premium. Not only that, you'll need to consider porportion of the tent and ample clearance between the tent and exsiting structures. To help with this process, one of our on-site coordinators will be happy to inspect your event site. Contact us to schedule an inspection. 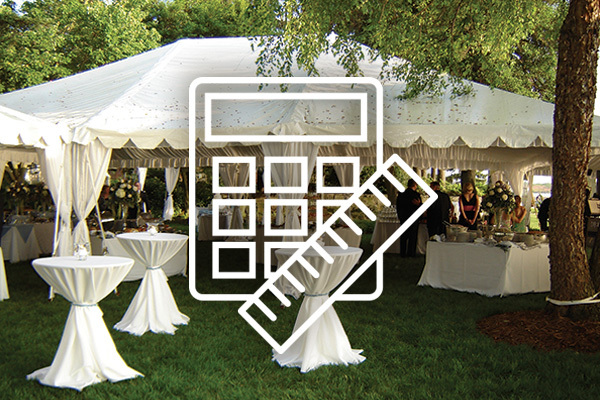 Input your event needs below to get an estimate of the space you'll require to host your event – either at a venue or with a tent rental. Your event details are completely confidential. If you'd like assistance planning your event, please contact us.